Joeann Smith was charged in connection with the Wednesday shooting of 56-year-old Willie Smith. 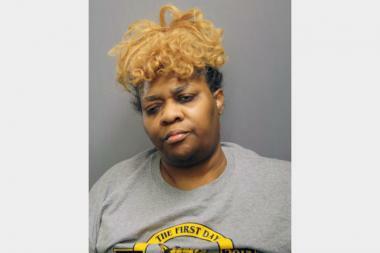 COOK COUNTY CRIMINAL COURTHOUSE — A South Shore woman shot her brother in the eye during an argument about whether his gun could fire, prosecutors said Saturday. Joeann Smith, 52, appeared in bond court Saturday afternoon in connection with a shooting earlier this week that left her older brother, Willie Smith, brain dead. She was charged with felony reckless discharge of a firearm charge. Prosecutors said Willie Smith, 59, came over to his sister's apartment in the 1700 block of East 72nd Street on Wednesday. The two began drinking, and Smith pulled out a .22-caliber revolver from the bedroom. Willie Smith said the revolver was too old to work as he and his sister took turns handling the gun. At one point, Willie Smith handed the gun to his sister, and it went off while her finger was on the trigger, Joeann Smith later told police, according to court documents. The shot went through Willie Smith's right eye and lodged in his brain, according to court documents. Joeann Smith called the police about 7 p.m., and when officers arrived at the apartment, they found the 59-year-old man "laying on the living room floor face down and breathing slowly," according to police reports. Smith told police she had shot her brother when "they had been playing with a gun and it had accidentally gone off." Police found the gun stashed under a sofa cushion in the living room, according to police reports. Willie Smith was rushed in critical condition to Northwestern Memorial Hospital, where doctors found the bullet had left Smith brain dead. Smith, of the 500 block of N. Desplaines St., was pronounced brain dead there at 9 a.m. Friday morning, according to the Cook County Medical Examiner's office. Authorities said he is being kept alive so his organs can be donated. But in court Saturday, prosecutors told Cook County Judge Donald Panarese Jr. that Smith was still on life support, though would likely not make it. A public defender told Panarese that Smith suffered from a number of health problems, including glaucoma. Standing before the judge, Smith squinted to see, and the 52-year-old needed help finding the door to leave the courtroom. Panarese ordered Smith put on electronic home monitoring and released her with a $250,000 personal recognizance bond.